john4jack (Corvallis, Oregon, United States) on 23 August 2009 in Business & Industry and Portfolio. You wouldn't believe the crud what was on the hull of this boat. Fiona loves seeing boats in slings. Wonderful colors and very interesting work! It is amazing to see that whole boat lifted in the air! Great shot Jack! Bright color, wonderful detail, interesting story. I've never seen this taking place before. Thanks. @Dulcie: Common scene in working boatyards. Fascinating image - I keep seeing new details every time I look at it. Well captured. @Veronique: Also barnacles. In addition to power spraying, they scraped the bottom. Good working shot,lots going on. Love the big, bright colours! Great colors and a beautiful composition for this shipyard ! Some of the crud is on the ground! Wonderful shot, something I would never get to see otherwise. These boat lifts are so impressive with how easily they handle these large and very heavy boats. It's easy to see why a dirty hull increases fuel consumption and slows the cruising speed. Nice shot of the hosing off action. Wonderful colors, and the story is neat! I have never seen the underside of a boat like that! Too cool! 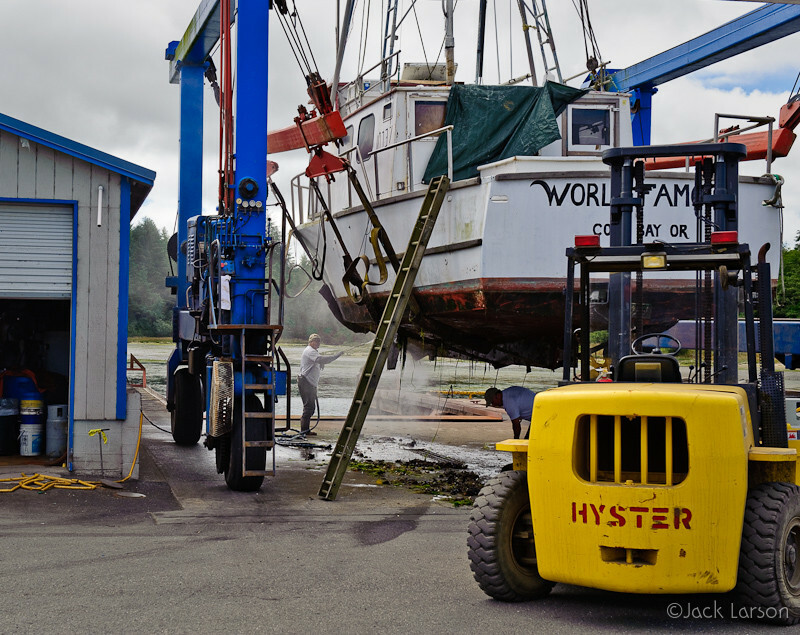 @MARIANA: It's a common scene in working boatyards. Our granddaughter goes bonkers over big boats in slings. I like seeing boats in slings too....nice catch. @Lorraine: So delighted that you are still with us. @shallowregret: You could spend days photographing (which, of course, we did). Nice one...lots going on there. I love those bold, primary colors! @Nadia Olisa: Thank goodness it is their mess!! So much going on in this image. It feels full of action despite the fact that most of the objects are sitting still. @B. Thomas: Unfortunately I have already deleted all of the shots taken after it was clean. Looks like a great location to get some interesting shots. This is a good action shot. The spray from the presher washer probably make the task much easier. @Lee: The spray made the shot. We did the same for my small boat the other day. I can only imagine what a mess this big boat was to clean up. Nice.